Building a deck takes a lot of resources, effort and time. But, in most cases, the finishing seems to take a huge chunk of the time. Although painting the deck is also an option, stain seems to be what many people prefer. However, to get the best from it you need to understand what it is all about, the different types and also how to choose the best deck stain for your home. In this piece, we highlight some of the vital things that you need to know about deck stain and also review 6 of the best deck stains out there. There are different types of decks stains out there, and so you have plenty of options to pick from for your deck. However, the most important thing is to understand what is the best for your particular needs. For many people, this should be easy as they only need to use what is already in the deck. But, if it is a new deck, things are not always that straightforward. The best deck stain for you depends on the type of wood that you want to stain. If your deck uses rare wood types like cherry, aged pine, mahogany, and maple, you might not even need to use any stain as they look great when natural. But, besides from the wood type, your personal preferences should also guide you in determining the best wood stain for your deck. And to get an idea of how the stain looks on your deck, you can try it on an inconspicuous part of the deck. The kind of finish that you want also determines the best deck stain for you as some will provide a clear finish while others are opaque as they allow little grain to show. The best one for you still depends on your preferences. An important point to keep in mind as you decide the best deck stain is whether you prefer to use oil-based or water-based stain types. While both have some unique benefits, they will also have some shortcoming and drawbacks. And weighing between the pros and cons (for your particular situation) should help you decide which of the two is best for you. Semi-transparent wood stains like this water-based one from Defy make it possible to add some color to your deck while still allowing the wood grain to show. The environmentally friendly stain also produces a natural-looking matte finish that will make your deck stand out in the backyard. And you can get it in 7 different colors which make it possible to find something that matches your home’s exterior. Although it is one of the priciest deck stains on our list, the quality of the finish makes it worth it. It uses some high-quality resins to make it more resistant to common wood stain problems such as fading and darkening. 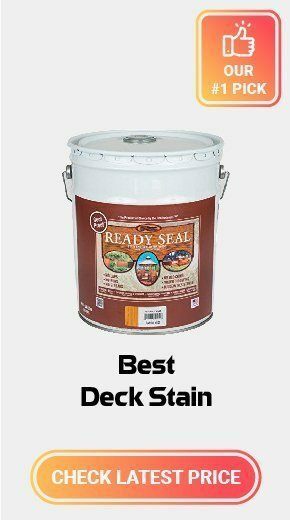 With the enhanced mildew and mold resistance of the stain and ease of maintenance, this will be a great stain to have on your deck. The oil-based Ready Seal also comes in 7 different colors to make it possible to get something that suits your preferences. It is also a semitransparent stain and it will be great when you want to keep the wood grain visible. Applying this deck stain is relatively easier than many other oil-based ones and you can use a roller, brush or even a sprayer to do it. But, one of the best elements about it is that you can use it in a wide temperature range and so it will be suitable for use in various localities. This stain will provide coverage of 175 square feet for every gallon but if you have a deck with some old lumber, you will need more stain to cover the same area. Also, this deck stain will not require a primer and it will penetrate deep to protect the deck wood. Thompson’s Waterseal is the cheapest item on our deck stain reviews. And despite the affordable price tag, it can still provide coverage of up to 400 square feet per gallon depending on the surface you are staining. It is highly useful in preventing water damage and it uses some advanced polymer for fade resistance, and it is quite effective in resisting UV damage and mildew. The transparent stain makes it possible to keep the natural wood grain visible, and homeowners can choose from 5 color options. You can apply this stain on both freshly cleaned and damp or dry wood. And it is also ideal for multiple applications as you can also use it for other outdoor wood staining purposes. If you prefer the good old redwood finish on your deck, here is a great option for you. The semi-solid oil-based deck stain will not crack, peel or blister and so it will last for longer than most others. It is a deep penetrating stain that will protect and preserve your deck lumber for a long time and the finish that it provides is also water-repellent. The ultra-pigmented oil-based stain provides a rich color and it will last for longer than most other semi-solid stains. And the color that you get on its application is fade resistant. With this deck stain, you will also get some significant UV protection and it is resistant to both mold and mildew. The relatively inexpensive KILZ semi-transparent deck stain offers long-lasting protection for your deck, but you can also use it for other outdoors staining applications. And besides from the long-lasting protection, this deck stain also waterproofs the deck wood and is mildew resistant. It is very useful in maintaining the beauty and integrity of the wood under extreme outdoor conditions. The 100% acrylic formulation will protect your expensive deck wood from snow, sun and rain damage. And the manufacturer backs it with a 3-year warranty for deck staining to prove that it lasts for long enough. With a gallon of this transparent deck stain, you can cover up to 250 square feet with the first coat, and an impressive 500 square feet for the second. Here is a typical deck stain that will work for almost any kind of wood, and it will offer a long-lasting coat that is also scuff resistant. The deck stain coat that you get will also be resistant to harmful UV and mildew to keep the deck wood in good shape for long. Under normal conditions, it should dry in less than two hours which is a relatively short time compared to others. But the best part about it is that it keeps the natural wood grain visible to give the deck an appealing look. Miniwax deck stain provides a larger coverage that many other wood stains for both smooth and rough lumber. And you can apply it with a brush, exterior paint pad, roller or even a sprayer. The cleanup is also quite straightforward, and you can do it with some soap and water within a short time. You can get this deck in 4 different colors and up to 42 colors when mixed. There is more to picking a deck stain than just going for a color that you like as they come in various types available out there. Although there are different ways of classifying deck stains, the following are the most common types. Clear deck stains are by far the most popular type since most people prefer to use something that shows the natural grain of the wood. Most clear deck stains or deck water sealers as they are fondly known do not contain any oil or pigments but some will have little oil/pigment. However, almost all types will have water repellent and wood preservative compound to protect the lumber. These stains are easier to apply than most other types. But their main shortcoming is that they gray and oxidize after a few months and so annual reapplication is necessary. Semi-transparent deck stains are the kind that will put some color tinting to the deck while still making the grain visible to some extent. These stains will soak into the wood and this means that they tend to last longer than most clear stain types and also offer more protection to the wood. They are a good choice for expensive woods like cedar and redwood. And although the semi-transparent stains still do not last infinitely, they provide excellent wood penetration. With some types, you can go for at least two years without having to reapply. Due to the ingredients in these stains, they are less likely to peel off the deck and so your deck will still look fantastic even as the stain ages. You can get these stains in both water and oil-based versions. However, with the semi-transparent stains, the oil-based ones seem to perform better than the water-based stains. Solid deck stains are also what many homeowners will refer to as the opaque stains and they are the longest lasting of the three main types. If you go for a high-quality brand you can go for at least three years without having to reapply. These deck stains are a great choice when you want to make a bold statement and have little concern with showing the grain of the wood. Solid deck stains will not penetrate the wood and will instead seat at the top and cover it like paint. They are very useful when you want to cover inconsistencies, flaws or discoloration on the deck and also for adding some warmth to the outdoor space. There are plenty of solid deck stain colors out there and so it should be easy to get something that suits your tastes or matches your home. But, like the other two types, these stains also have some drawbacks. Besides from hiding the wood grain, they are prone to peeling, cracking and chipping. Also, the solid deck stains can build up an ugly film. Just like the semi-transparent deck stains, the semi-solid stains will only show a small amount of the wood grain. And this is because they contain a high amount of pigment. Semi-solid deck stains can be both water and oil based, but only a few companies manufacture them. Their greatest advantage is that they provide great UV protection for your deck. The oil-based types perform better than the water-based as they will penetrate the wood. Now that you know the main types of deck stains out there the other equally important thing is to understand the differences between the oil and water-based stains and their pros and cons. Oil-based deck stains are the older of the two types as they have been around for at least three decades. They are the penetrating type of deck stain and most will contain both synthetic and natural oils like paraffin oil, tung oil, and linseed oil. Read More: Tung Oil vs. Linseed Oil: Which Should You Use? They give the wood on your deck excellent protection by penetrating through its pores. And since they penetrate into the wood, they are also easier and quicker to apply. The best oil-based deck stains are also easier to maintain than the water-based types because as they start to age they will just fade and wear away. Applying another coat is all you need to do to maintain them. However, the oil-based deck stains are not very eco-friendly and they also come with a stronger odor that takes longer to dissipate. These deck stains also require more time to dry and cure because of the oil components. Water-based deck stains have become a norm in the past few years as more and more homeowners prefer to use environment-friendly products to maintain their properties. Changes in laws in many localities to prohibit VOC's (volatile organic compounds) are also a contributing factor to the increase in popularity of water-based deck stains. These deck stains tend to adhere better to surfaces that have undergone some sort of staining or painting. And most tend to retain their color better than the oil-based deck stain types. The water-based deck stains are more breathable which means that they will not retain moisture. And this makes them more mildew and mold resistant than the oil-based ones. Other positive elements that set the water-based stains apart from the oil-based ones include the fact that they are quick drying, have fewer odors, are non-flammable and are also easy to clean with soap and water. However, the quick-drying can also be a shortcoming as it makes them harder to apply, and this is more so for those with large decks. Also, they will not penetrate the wood as deep as the oil-based ones. Water-based decks stains are best suited for lumber that resists decay naturally such as cypress and cedar. Whether you are finishing up a new deck or want to breathe some new life into your old one, you will need to choose whether to paint or stain it. While in most cases it will depend on your personal preferences, it is important to understand what you stand to gain from both painting and staining. Painting is always the obvious option for some homeowners as it looks easy. And to make it even better, the paint will last for ages and will require minimal maintenance and all paints offer UV protection. Even if you decide to use the best quality and expensive deck paint it will be cheaper in the long run as it lasts for a long time. However, paint covers the wood grain and it will not be a good choice if you want to enjoy the natural beauty of the wood. And it is also more likely to trap moisture in the wood. A quality deck stain, on the other hand, will penetrate the wood and seal it, and this is more so when using the oil-based versions. And it does this while also allowing moisture to escape. The stain will rarely peel, chip or crack as your deck wood swells and shrinks due to changes in temperature. And if you use the solid-color stains, you will also get a decent amount of UV protection. But, the greatest advantage of staining your deck is that it keeps the wood’s natural grain or beauty visible which creates an aesthetically appealing deck. The decision depends on the look that you want to achieve and your preferences. But if you do not mind reapplying stain after every couple of years it is a good option. Also, the stain is the best option for those that want a more natural looking deck that maintains the natural beauty of the piece. If you do not have the time or you just hate working on your deck every few years, then you should paint it. Also, paint it if you want more UV protection and color options. Your choice of a deck stain will affect more than just the appearance of the deck as it also determines the durability of the lumber. The good news is that there are more than enough deck stain options on the market. All you need to do is to understand how to pick the best deck stain for you, but this should also not be hard as you only need to consider the points below. One of the first decisions that you need to make when buying deck stain is the type to choose. Here you will not only need to pick between water-based and oil-based but also from the four common types. The type you choose depends not only on your tastes and preferences but also on the wood type that you have on your deck. For example, water-based types are best for cypress, redwood and other wood types with natural decay resistance. Deck stain is in most cases cheaper than paint but you still need to consider the coverage area when buying your stain. Remember that you need to reapply the stain at least once every couple of years. The coverage area will vary from one brand to the other because of the difference in formulation, but the larger the area you can stain with one gallon the better. However, you should never compromise on the quality of the stain just to get something that covers a wide area in one gallon. A stain that covers at least 100 square feet with the first coat is good enough. Just like paint, you can get deck stain in various colors and so you need to pick something that complements or enhances the appearance of your home. The best way to choose a stain color for your deck is by going for something that matches an unchanging color in your yard such as your home’s exterior. Doing this ensures that your stain choice will remain relevant for a long time and you will not need to change it. Also, you can match the stain color to the wood that you use on the deck if you want a more natural look. Common deck woods such as pressed pine has an appealing green shade and if you like it a clear stain would be the best choice to maintain the look. But, remember to test out the color on a small section of the deck to determine how it will look and strip it off if you do not like the appearance. Whether you prefer to use water based or oil-based deck stain the best brands will not be cheap. However, you still need to make sure that you get the best value for your money. If the price of the deck stain is high it should also be top-notch quality and also provide a large area of coverage. But, also avoid going for unusually cheap brands because in most cases they will also be low quality. Good deck stains will retail anywhere from just under $20 to close to $100 per gallon. Step#1: As with anything, the deck needs to be clean before you start staining. Sweep the floor and remove any hard debris like leaves. Step#2: Use a mild detergent to sweep and brush the deck. Ideally, the detergent needs to contain an anti-grease compound that will break away oily and fatty substances on the deck. Allow the detergent to set for around 10-15 minutes then thoroughly wash with water pressure or a garden hose. It should be very clean at this point and you should get a better idea on how many coats of deck stain you will need. Step#3: Once the deck is dry, scrub to remove any imperfections. You can use a sander to polish bumps or remove residual paint on the deck. Once you are done, sweep the floor one more time to clean it. You can use a synthetic-bristle brush for best effect. Make sure your brush is long as this will prevent any back pain from happening. Step#4: Once again, use a power washer equipped with a 45-degree tip and set to 1,200-1,400 PSI. Make sure not to make the tip come too close to the deck. Ideally, keep the tip at least 8 inches away from the deck to prevent damaging it. Step#5: Once this is done, you will see residual imperfections with more clarity. Lightly sand one more time if you have to and you are about set to start staining your deck. Remember to sand in the direction of the wood vein and never against it, as this will most likely damage the wood. You should only consume a few minutes if you use a power tool like an orbital sander with an 80 grit sandpaper. By using a discardable brush, apply a stain sealer to the cracks and side of the wood. It is very important to wipe off the excess sealant and stain or it will look uneven. Use a clean rag to do so. When staining a deck, one thing you will notice is that you need tons of rags to wipe. Make sure that you have a plenty supply of clean rags for this purpose. It is important to look at the wood grain direction and stain along it and never cross-ways. Going across the wood vein will result in a poor and unprofessional finish. Wet rags that have been used to wipe oil-based wood stains are extremely flammable and should never be thrown away when wet. Make sure they dry completely before you throw them away. Wood stain is toxic. You need to use rubber gloves at all times when applying it. If you have a large deck, then you will spend a considerable amount to stain it. You can always invite a friend over for much needed help. Another lifesaver tip is, instead of kneeling down, you can use a pole sweeper to stain. You back will thank you for it. Staining is one of the best ways to finish your wooden deck. Also, it gives the deck a very appealing look that will enhance the overall appearance of your backyard. Deck stains will come in various types and in different categories and so you will have plenty options to pick from when shopping. Understanding the different types and the pros and shortcomings of each as highlighted in this piece should make the decision easy. But, also remember to try out a stain on a small section before applying it on the entire deck as you cannot be certain that you will like the appearance until you see it on the wood. Lastly, our reviews should give you some idea on some of the best deck stains out there and also some of the brands that you can trust to have something that suits your deck.